Carolyn Twede Frank loved to write in junior high and high school and made journalism her minor in college. According to her blog, her journalism teacher “tore down her work” and discouraged her to the point that she dropped her minor and graduated from Utah State University with a bachelor’s degree in horticulture and a master’s degree in botany. While raising her five children, she grew an international business in manufacturing puppets and educational curricula. After she sold most of her business, she began writing again. She is the author of The Hitler Dilemma and Trapped in East Germany. She is also the author of The Quantum Faith Effect Series (Existence, Emergence, Remembrance). 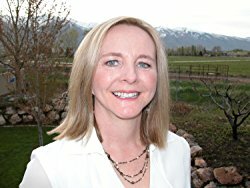 She has written a middle grade historical fiction, Promises, and a children’s picture book, Hunter, which she also illustrated. This page was last edited on 20 July 2017, at 11:36.